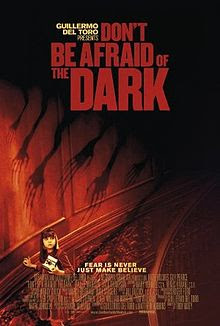 Cultural Compulsive Disorder: I Can Not wait To See "Don't Be Afraid Of The Dark"!!! I Can Not wait To See "Don't Be Afraid Of The Dark"!!! I am really looking forward to this film that is written and produced by Guillermo del Toro and directed by Troy Nixey. Often times you hear of films cutting out scenes to get a lower rating. The complete opposite is true here. Guillermo and the crew had aimed for this one to be rated PG-13, but didn't want to scrimp on the scariness of the film. This lead to an R rating for "pervasive scariness". Yup... sounds like they did their job a bit TOO WELL!!! I can't wait to see this one. Check after the jump for the full length trailer that shows off some of the impressive monsters/creatures from the film. Great poster as well, right? The movie is coming out August 26th. I was a huge fan of the original Don't Be Afraid of the Dark, and am eagerly awaiting this remake. This is how you do a remake.